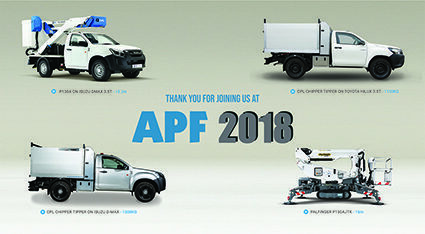 This year saw the return of the famous APF show, One of the largest forestry, woodland and arboriculture shows in Europe. We launched the CPL Toyota Chipper tipper at the APF Show 2018 and received some great feedback from the industry experts that helped us design this robust work horse. We sold the demo vehicle at the show which was a great compliment to the CPL team. The CPL Toyota Chipper Tipper is now available to order. Along with the new arrival we showcased the CPL Isuzu Chipper Tipper which is fast becoming the most popular vehicle of this type. This unit boasts the 3.5t suspension upgrade and a full type approval allowing for over 1300Kg payload. The market leading Isuzu P130A Access platform was also on stand. The most popular of the CPL units with an impressive 13.1m working height and 6.2 working outreach. This conversion has the added extra of a full type approval including the tow bar. It also has a substantially large safe working load of 240Kg in the basket. Brampton Valley Training and Assessments joined us to demonstrate some of our large variety of access equipment. They had our Palfinger P150AJTK on stand. This tracked spider is one of the most compact on the market at just 780mm wide. With a 15m working height and 220Kg in the basket, this unit is becoming very popular across a number of sectors. If you would like us to demonstrate any of the vehicles seen at the show Contact Us.